So what would you do if you saw an email giving away men’s neckties? Yep, you say…”sure I’ll take them!” Well, maybe you wouldn’t, but I sure did. Look at the box I scored! And they are mostly open, insides removed and washed! Score again! Ready to cut and sew. 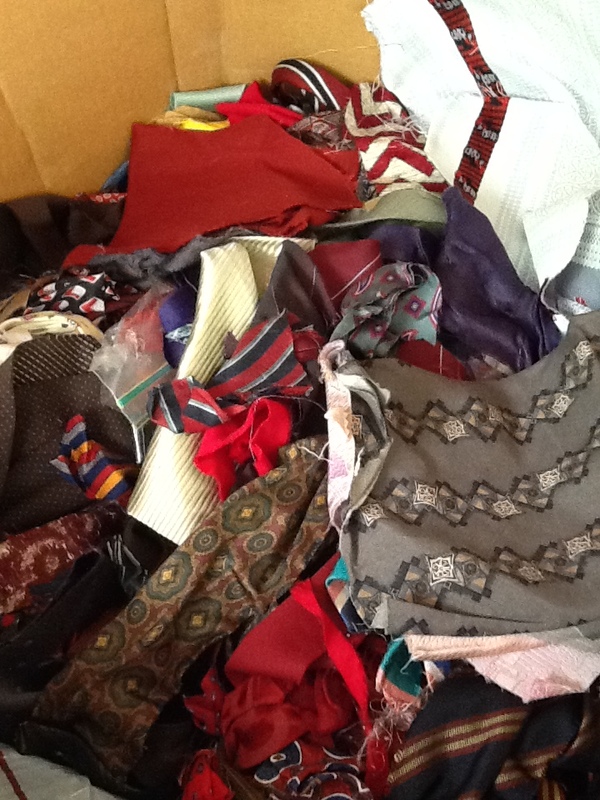 #1- answer the call for free fabric, even if it is in the form of neckties….SCORE! Look at all that useable fabric. The one shown below is 9″ at the widest and half is about 24″. And most of them are silk! NOW, what to do with them? I’ve always wanted to make a quilt incorporating ties. Here is my chance without having to buy a single tie. 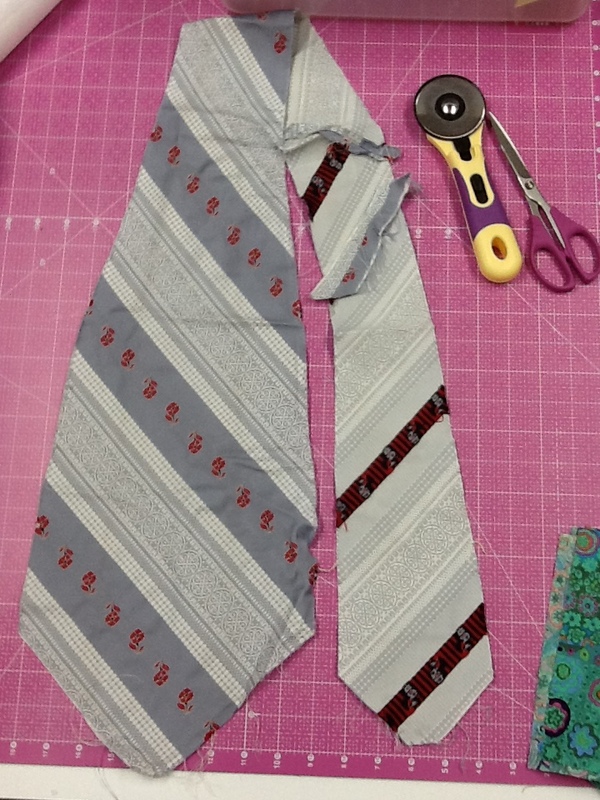 I’ve agreed to teach a class on neckties for the Blackstone Heritage Quilters Guild next season. I’ll probably have enough for the entire class. Well, not enough for each to make a quilt, but at least enough for a project. Check back this fall to see what we will make. If you use ties that are of different fabric types…and because most are silk…it is best to stabilize them or sew them onto a foundation. A foundation can be as simple as a piece of muslin. #2- Sew ties onto a foundation for stability. 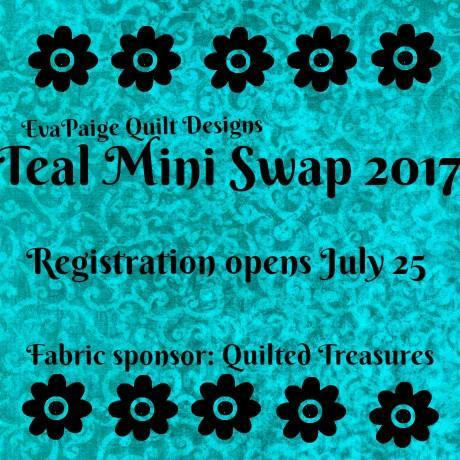 Now, to change subjects for a minute… Beth Helfter of Eva Paige Quilt Designs is the headquarters and brains behind the ” Teal Mini Swap”. Monies raised will go to the Ovarian Cancer Research Foundation and Alliance. Sign ups (registration) opens July 25th. Check out her website for full details. And there is also a Facebook page. I participated last year and enjoyed meeting my swap partner in Kansas. (So close to my “hometown”!). I hope you will consider joining. Last year over $6,000 was sent to OCRFA!! Ya never know, we could be partners. 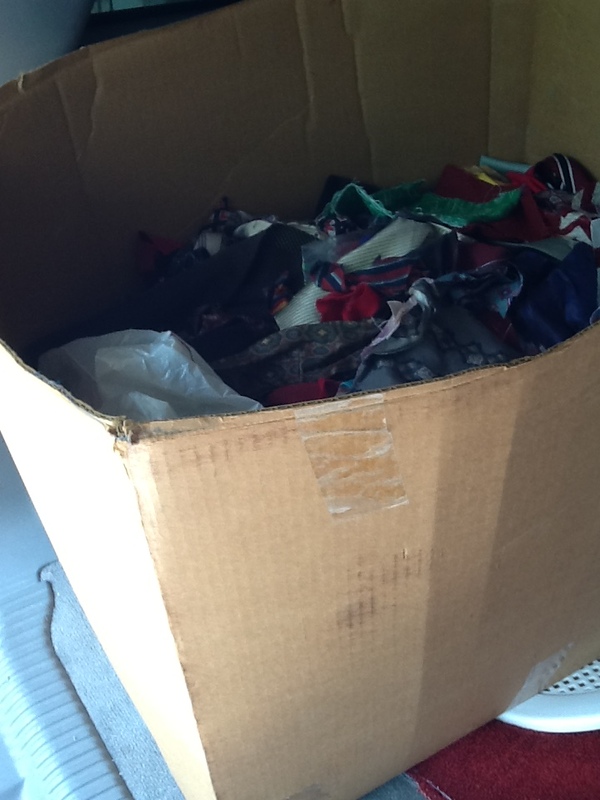 This entry was posted in Neckties, Teal Mini Swap, Tips, Uncategorized. Bookmark the permalink.